Getting a top quality tire dressing is now more affordable than ever with the Meguiar's Hyper Dressing. Most tire dressing are used as is and some can be diluted down to a 1:1 ratio at best. This exceptional tire dressing can be used at 1:1 ratio (water:dressing) or diluted up to a 4:1 ratio (water:dressing). Use it at a 1:1 ratio (water:dressing) if you want that overly glossy apperance that is sure to turn heads. If you prefer a semi-gloss look try the 2:1 ratio (water:dressing) and if you like a nice matte finish or just the best value possible a 4:1 ratio (water:dressing) will work best. This dressing is easily absorbed in to the rubber so the shine looks great when you first apply it and for weeks later. 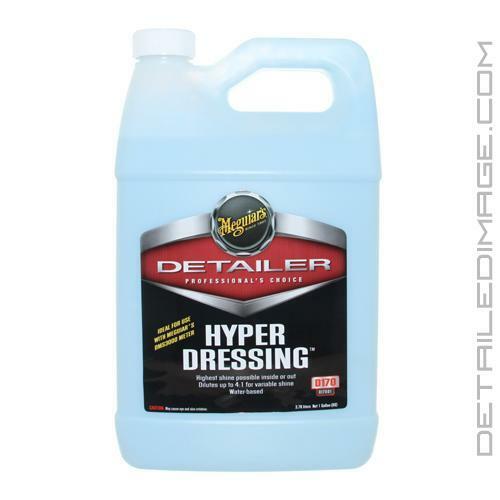 The Hyper Dressing from the Meguiar's Professional Detailer Brand offers tremendous value and a highly effective formula that every detailer can appreciate. Get more bang for your buck and a better shine with the Meguiar's Hyper Dressing! Pair with the Meguiar's Hyper Dressing Bottle (D170) and the DI Accessories Chemical Resistant Spray Trigger for easy dilution, storage, and usage! HYPER DRESSING Until now, the industry average for diluting water based dressings has been one to one or ready-to-use. 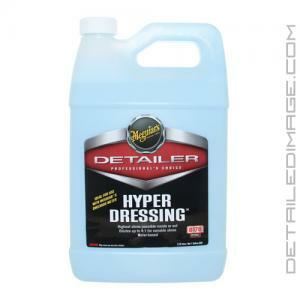 Meguiar's Hyper Dressing dilutes up to four to one, varying the gloss from high to satin. One product, multiple uses a winning combination for every professional and an industry first. DIRECTIONS: For best results, dilute to proper specifications. Spray or wipe on surface. NOTE: When applying to tires, wipe off excess (especially in grooved areas) to prevent spin-off, which may stain painted plastics. Do not use on tires or seats of motorcycles, bicycles or other two-wheeled vehicles or surfaces that should not become slippery. PROFESSIONAL TIPS: To restore shine and luster to all engine components, clean engine compartment with Super Degreaser , blow excess water with compressed air and apply liberal amounts of diluted Hyper-Dressing and allow to dry. So far works better than what I anticipated, would definitely buy it again. Great product by Meguiars, I use many of their other products in my detailing arsenal. I like the fact that you can just spray and walk away, only occasionally do you need a mild second spritz. Depending on how you dilute it you can go glossy down to matte, but still looks good. I prefer a water based dressing, don't like the gunky build up from silicone based products. Will definitely continue using this product. You guys offer awesome products and more importantly the best technically and customer service support within the industry!